'Ice sailing on the Hudson - photo by Times Herald-Record - Tom Bushey' . Down, far below the Kingston-Rhinecliff Bridge, up-river from New York city, the vessels skittered across the frozen Hudson River like giant praying mantises. Bob Wills turned to his friend. 'What are those?' he asked. He made his friend turn her car around in the middle of that very long bridge. Wills had carried a set of speed skates with him that day, and he now took them and headed for the river. The Hudson had frozen hard that winter, capped by 8 inches of black ice. Wills could see the fish swim below his blades. He raced on to join an audience of about 200 people. Some 100 years before, it would have been 2,000 people. The New York Times would have recorded it. A Roosevelt or two probably would have captained boats or at least watched. But Wills hadn't yet learned about that long history. All he knew is he'd seen a glimpse of the yachts and he had to see more. Over the next two decades, Wills, of Rhinecliff, would see much more. He's now secretary of the Hudson River Ice Yacht Club and was once the club's commodore. He tries to explain the feeling of lying on your stomach, 12 inches above the ice, flying down a frozen river at highway speeds. The feeling is such that club members work year-round to maintain century-old boats on the off chance a cold snap will freeze the river deep enough to sail on top of it. Just four of the past eight winters have met the standard, and that's considered good. Club members displayed their yachts Saturday on the lawn of the Franklin D. Roosevelt Presidential Library. The exhibition will continue until Jan. 3. Wills' boat, the Kriss, once belonged to John Roosevelt, uncle of Franklin. John was the founding commodore of the club and helped introduced his young nephew to the sport. FDR became such an enthusiast he is said to have rejected a New York senator's bid to use icebreakers on the Hudson, solely because it would hinder ice yachting. Such enthusiasm has faded from the sport, except in those who have lain flat, inches above the ice and let the wind take the sails. Wills and the others are just waiting for the river to freeze deep enough to sail on top of it. For those who live in the vicinity, the ice yachts will be on display daily through Jan. 3, except Jan. 1, at the Franklin D. Roosevelt Presidential Library, also on the Hudson River. For more information, to join the club or donate that old ice yacht in your barn, go to www.hriyc.org. there. Something sizable would be ideal. type home at all, it can be honestly middle-class and authentic in that way. An "Auto Mechanics/Garage." The leading man in the script is a mechanic. A park with a swing set. Shoppers earlier this week try to get their holiday gifts done. Welcome to the season's second Black Friday - only this time around the deals are even bigger. Offering the deepest discounts of the year, desperate retailers are hoping for a flood of shoppers Friday. Several major stores, including Macy's and JCPenny, are slashing prices to record levels and opening their doors in the predawn hours in a bid to salvage one of the most disappointing holiday shopping seasons on record. Shoppers are ready to pounce. "We're not looking for anything specific," said Renee White, 44, a social worker from Queens, while shopping with her husband and two young children yesterday. "Whatever looks good, if the price is right, we'll get it." From expensive coats to children's toys, shoppers will have their pick of a host of items up to 60% off at many of the city's most renowned stores, including Macy's,Bloomingdale's, Toys "R" Us and Saks Fifth Avenue. Amid the deepening recession, retailers are facing an uphill battle to match last year's holiday season. ShopperTrak said sales last Friday through Sunday fell 5.3% compared with last year's weekend before Christmas. Foot traffic in stores was down a whopping 23.7%. Enjoy the fireworks and amazing Statue of Liberty and NYC views! Great way to to bring in the new year without having to travel. 2009 New Year's eve Cruise! The stripped bass is an ocean going fish that comes into coastal rivers to spawn. Each spring, large schools of this hard fighting game fish head up the Hudson River in New York turning that river into one of the most exciting game fisheries in the United States. From the Tappan Zee Bridge outside of New York City up river into the heart of the state, the fish move toward spawning grounds feeding on shad and herring. It is their schooling and heavy feeding tendencies during their spawning run that makes them both an easy and a challenging fish to pursue. The season on the Hudson River for stripped bass fishing runs from March 16 to November 30. No license is needed to fish on the river, but one is needed to fish on any of the tributaries leading into the Hudson. So, it is wise to be careful if you do not have a license and stay on the main river. vending machine fish under 18 inches long must be returned to the river and there is a limit of one fish per day per angler. This limit makes stripped bass fishing on the Hudson River an ideal catch and release area. One of the things that will amaze you about this fish is that they grow very, very large. It is not unknown for an angler to snare a 40 pound stripped bass during the spawning run. There are a lot of different types of fishing and lures that can be successful on your quest for a stripped bass. Since vending machine spawning fish are following the herring and feeding on them with a pre-spawning hunger, it stands to reason that herring makes good bait. You can use live herring presented in a natural manner or use cut chunks of herring. Either method is equally successful. Another thing that makes Hudson River stripped bass fishing such a good deal for the Northeast angler is that you can have just about as much luck right from the banks of the river as you can from a boat. It might take a little looking around, but generally shallow areas by the banks and areas where small streams vending machine into the river are gathering spots for the stripped bass. The main advantage of a boat is the ability to follow the schools of fish around the river. Most locals suggest eels as the ideal bait when fishing from the boat, although shad can be used as well. ALBANY, N.Y. -- USCGC Sturgeon Bay Commanding Officer Lt. Scott Rae said, "Our ice season for the Coast Guard begins December 15th and runs until March." "This ship is about 20 years old," said Lt. Rae. "Built specifically for ice breaking." But once the Hudson River freezes, the 140-foot Coast Guard Cutter Sturgeon Bay carves a path for the other ships from Albany to New York City. Lt. Rae said, "We break ice for flood relief in rivers and tributaries that need relief so the towns and areas around rivers don't flood." Lt. Rae said their mission is to provide security and keep the river clear for search and rescue, limit flooding risk, and keep necessary supplies moving from port to port. Now you might be asking yourself how the cutter stays clear of ice itself. It has a bubble bath system - creating bubbles going around it which keeps the ice free and clear, allowing the ship to get underway and chop through ice as thick as 30 inches, continuously. Chief Warrant Officer Chris Brady said, "It's a hull lubrication system. It's a giant air compressor. We have holes drilled through the bottom of the ship. When we blow air through the bottom, the water rushes up and helps us get through the ice a lot better." The crew of 20 can live aboard the ship for weeks if needed. Lt. Rae said every three to five years they expect a major river freeze, something that hasn't happened now in a couple years. He said, "Last year we had no ice at all...We might be due. The year before that was a light season, about six weeks long. We're entering that cycle now. So possibly we're due." Lt. Rae said if there's no ice by mid-January, there probably won't be, giving anyone with an eye on the Hudson some insight into the weather, which can change the Hudson River Coast Guard from federal policemen to ice-cutting heroes - if you just add ice. film crime thriller "Sins of Sorrow." They are looking for a church interior for the FINAL SCENE. The scene specificly needs an area that has pews in it. The scene requires a small crew and includes use of (fake) prop weapons. The scene will require one day use (approx 5-6 hrs). The script or script pages can be provided as needed. or do you know where one can be found?! Nicole Bengiveno/The New York Times The Pond at Bryant Park plays jazz and Broadway show tunes. SOME of the most arresting and otherworldly photographs of New York are those turn-of-the-century black-and-white pictures of people skating on the lake in Central Park: the women in bustled skirts, the men in bowlers and the lonely outpost of the Dakota in the background. That was back when we had winter. Anyone trying to skate in New York these days, except on artificial ice, would surely drown, and lately it has been so unnaturally warm that unwary, overdressed skaters venturing out onto the city’s several outdoor rinks have even risked heatstroke. A great deal of the fun of skating in New York, however, consists of rubbernecking — of studying your surroundings and your fellow skaters — and in any weather, even a little drizzle, it’s always worth the effort. Why not start with the rink at Rockefeller Center, which turned 70 on Christmas? 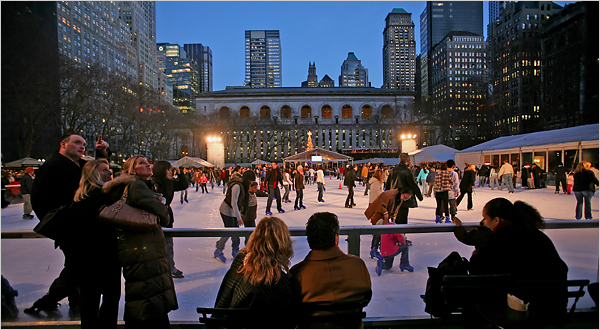 You’re going to want to skate there, probably the most celebrated rink in the world, at least once in your life, and with the tree up and lighted, and the place thronged with tourists, you can enjoy the maximal experience. Oddly, it proves in large part to be an experience of miniaturization. Except for the price — until Jan. 4, a steepish $14.50, or $17 on weekends, for an hour-and-a-half session — everything about the Rockefeller rink is tiny: the ice, which is 122 feet by 59 feet, or seven or eight brisk strides end to end; and the skatehouse, a windowless cubicle tucked under the stairs on the east side, which at the beginning and end of a session can resemble the lowest deck on a troopship. Even the Zamboni is pint-sized. When you get out on the ice, you experience an immediate, antlike sensation of being peered at by all the spectators looking down from the walkways above. Then you glimpse an alarming image of yourself, not nearly as graceful as you imagined, reflected in the ice-view windows of the Sea Grill and the Rock Center Café. This rink fosters self-consciousness, which is surely why it is home to the city’s most exhibitionistic skaters: those showoffs in full ice-show rig — the short, flouncy skirts, the one-piece jumpsuits, the tights that pull down over the skate boot — who cruise around in spread eagles and annoying arabesques. Happily, the Rockefeller rink also attracts some of the worst skaters around, the out-of-towners who have seldom, if ever, been on the ice before. They cling to the boards like shipwreck survivors or haul themselves along, hand over hand, as if traversing a steep pitch on the Eiger or sneaking like burglars from one window ledge to another. Every now and then one of these fledglings lets go and, with arms outstretched, attempts a glide, often ending in a pleasing, if unintentional, half-turn. The resulting grin is usually spontaneous and contagious, a reminder that this whole business of frozen-water navigation never ceases to be a little miraculous. A few blocks to the north, the Wollman Rink at the southeastern end of Central Park, may lack some of Rockefeller’s glitzy, touristic appeal — no Christmas lights, no splashing Prometheus fountain — but it’s easily the prettiest place to skate in New York. The ice surface is huge and vaguely trapezoidal in shape, which helps dispel that claustrophobic feeling of rink-boundedness. Wollman really does seem like a pond, or it would if they let you skate all over, in any direction, to your heart’s content. But it’s usually so crowded that the skate guards not only enforce the customary round-and-round traffic pattern, but also often reverse the flow, directing skaters to travel clockwise. For some reason right-handed skaters usually turn more easily to their left, which is why the traditional rink route is counter-clockwise. Forcing skaters to go the other way, a guard explained, is the equivalent of erecting speed bumps. More time, in other words, to savor the surroundings — the weeping willows, green and burnished gold at this time of year, at the southern end; the rocky cliff to the east; and, all around, some of the most beautiful buildings in New York: the Plaza on the corner and, unscrolling to the right, the rest of Central Park South like the backdrop on a stage set, with the stately towers on Fifth, off to the left, glowing in the late-afternoon sun. At certain times of day, when the light falls just right, they should reprogram the music here, and instead of the rock and hip-hop so popular at rinks these days, let loose with a few bars of Gershwin or Cole Porter. Lasker Rink, at the other end of Central Park, is proof, if proof were needed, of where the money is in New York. This rink, which doubles as a vast swimming pool in the summertime, is both scruffy and a little surreal. The ice is surrounded by a chain-link fence, and you enter through a cagelike maze. There are two sprockety-looking gizmos at the western end and, at the other, four enormous vaults that look like empty, blue-painted sarcophagi, or giant upturned bathtubs. The Zamboni rests above the ice and descends by means of a long ramp and then a little elevator. On a damp gray day, of which we had plenty this year, the whole place feels a little like a stockade on a far-off, slightly crumbling planet. In the old days Lasker too aspired to a kind of free-form, pondlike shape, but now, thanks largely to the swelling of youth hockey in New York, the surface has been divided into two adjacent and not quite regulation-width rinks. This creates a lot of available ice, and until the school and pee-wee teams start arriving in late afternoon, one or the other of them is usually empty. For $4.50 you can skate any which way you want, far from the wobbly-ankled crowds downtown, and no one will notice either your pratfalls or your nifty double salchows. Still farther north, the rink at Riverbank State Park, on Riverside Drive, is another no-frills facility. This rink, which opened in 1993, is on top of a wastewater treatment plant 70 feet above the Hudson and has a roof but open sides. Were it not for a grandstand (which probably doubles as a windbreak) the western side would afford a terrific view of the river and the New Jersey Palisades, while the other, unobstructed side looks over the West Side Highway. But skating north you can see the green-lighted, connect-the-dot curves of the George Washington Bridge, and on the southbound return trip you might catch a glimpse of the Fairway sign. So much hockey goes on here, and so much serious figure skating, that, except over the holidays, the rink is open for general skating only on Friday evenings and Saturday and Sunday afternoons. If you grew up in New England, as I did, this is the New York rink that may remind you the most of your youth. On a recent Friday it was as if nothing had changed: the breeze carrying a whiff of Zamboni fume; the exasperated skate guards whistling vainly at the teenage boys in hockey skates who were bombing around, whipping and weaving through the crowd, and stopping short every now and then to spray some girls with ice shavings. The girls shrugged, pushed off with the toe-picks of their figure skates and pretended not to notice. The only things different from, say, the Cleveland Circle rink in Boston about 1960 were the temperature, which was close to 60 degrees, and the bouncy Latin music, a welcome change from “Lady of Spain” and the other organ standards that seemed so tired even when they were new. Another place to see good skaters is the Sky Rink at Chelsea Piers. The Sky Rink, which is really two rinks (named in honor of a place, now defunct but fondly remembered by late-night hockey players, that used to perch on the 16th floor of a building on West 33rd Street, reachable only by a ponderously slow elevator), is not outdoors, strictly speaking. But the westernmost of the two rinks, the one normally used for public skating, extends way out over the Hudson on Pier 61 with glass on both sides, and there is also a clerestory skylight in the roof. Big, bright and airy, the place feels as if it were floating in the air. Chelsea Piers is a bit of a pain to get to, however, and like most of that enormous sports compound, the rinks tend to attract more or less serious athletes. Hockey is played practically around the clock, and the recreational skaters (who pay $11 a time) are less apt to be tourists on rental blades than people looking for some real exercise. For some reason the Sky Rink also features some of the weirdest outfits in New York. Late on a recent afternoon there was a guy dreaming the dream in full Rangers uniform — helmet, gloves, jersey, pads — and also a very tall, skinny fellow wearing tights, orange short-shorts and an undershirt from the Attager rowing team. He hurtled around, flailing a little on the corners, like someone possessed. The Kate Wollman Rink in Prospect Park, on the other hand, is arguably the most truly outdoorsy of New York’s outdoor rinks, the only one from which you cannot see a building or hear a lot of traffic. This rink is starting to show its age a little and could use a windfall of Trumpian generosity like the one that The Donald bestowed on the Central Park Wollman back in the late ’80s, but the setting is still bucolic, with the lake on one side, the Concert Grove on the other and a cattail marsh at the far end. And because the rink is unusually wide, it most nearly replicates the feeling of wide-open pond skating. Late on a recent Friday afternoon it was dotted with Orthodox Jewish skaters squeezing in a little ice time before sundown: little boys in velvet yarmulkes, their moms in snoods and ankle-length skirts. Gliding along, their feet barely seeming to move, these women looked a lot like those Central Park skaters of a hundred years ago. And finally, best for last: the Pond at Bryant Park, a yearly miracle that materializes on the lawn behind the New York Public Library. The ice freezes up at the end of October, just as it would in a more cooperative climate, and then in mid-January, around the time of an early thaw, the compressor is turned off and the whole rink is trucked away. Hemmed in on three sides by glamorous tall buildings, including the Grace Tower on the 42nd Street side and the old American Standard Building (now the Bryant Park Hotel) on 41st, the place feels both magical and protected, a sort of wintry secret garden where leaves from the plane trees occasionally tumble down and get decoupaged into the ice. The Pond, which is entirely free, by the way, plays by far the best skating music in New York — jazz and Broadway show tunes — and at nighttime especially you can feel like an extra (or even a principal) in a costumed ice show. Last year I got in the habit of arriving first thing in the morning, before work, and sometimes had the ice all to myself, or shared it on a few unlucky occasions with a guy who affected both racing skates and racing tights, into which he stuffed himself like a kielbasa. This year I’ve been going at lunchtime or late in the afternoon, when the ice is more crowded but still not mobbed. Part of the fun is spotting the many passers-by who on their way through or past the park are still astonished that such a thing could be taking place — ice skating, right on 42nd Street. The Palisades Parks Conservancy seeks to promote and expand the preservation of natural, historical, and cultural resources throughout our parks so they can be enjoyed by all. Always supporting NYS Parks, the PPC urges all members to consider the I-Give.com fundraising tool when shopping online. Every little bit helps as we strive to increase funding for the parks and historic sites we love so dearly. Every time you shop at any one of the over 700 name-brand stores in the I-Give Mall, the Natural Heritage Trust (NHT, the non-profit arm of the New York State Office of Parks, Recreation and Historic Preservation) will receive a percentage of each online purchase you make, at no extra cost to you - it's easy and free! Stores include: eBay, Lands' End, Staples, JC Penney, Barnes & Noble, Overstock.com, drugstore.com, Office Depot, QVC, Expedia, Home Depot, HSN, Best Buy, Gap, Buy.com, Nordstrom and many more. Step 2: You will be asked if you would like to download the I-Give shopping window. If you download the window, it will pop up at whichever participating site you are shopping at. Alternatively, you can begin your online shopping by going to the I-Give.com Web site to access the online store you want from there. Step 3: At no cost to you, I-Give.com will give a percentage of your purchase to the NHT, as a donation on your behalf anytime you shop through the I-Give.com Mall Web site or at a participating site with your shopping window.